Boston is bursting with opera productions this spring, more in a short span than I can remember in decades. 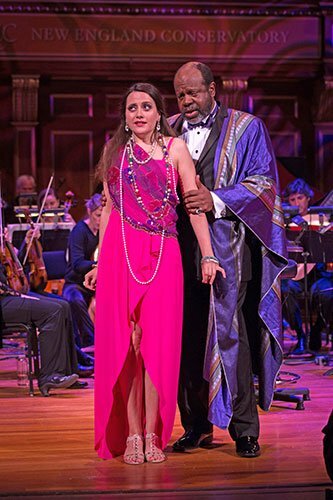 This Friday’s (and Saturday’s) production was Handel’s Agrippina at Jordan Hall with the Boston Baroque, who earns high marks for vocal casting, with local favorites and out-of-town superstars, all of whom knew how to act and to ham it up, and who seemed to be having the time of their lives. Handel was 24 when he wrote this opera, in mere weeks (like Messiah) during his extended stay in Italy. The first performances took place at the theater of San Giovanni Gristostomo in Venice during the winter carnival of 1709-10. The music consists of quite a few borrowed works of his own (mostly works heard in private salons) and adaptations from other composers. These works, extensively rewritten, became the basis of his overture and all but five of the arias in the opera. Smitten with Italian language and music, the composer hoped English music would be positively influenced by it. According to Laura Prichard, who gave the pre-concert talk, Handel was friends with many famous castrati singers and was an accomplished accompanist. The opera initially ran for 27 performances, the longest run any opera had had in Europe before this. Agrippina was meant to delight and entertain, and on Friday night this it did in spades. All but the bass baritone servant were historical figures. The family tree is so incestuous as to beggar credibility. The two stars are the power-hungry Agrippina, played to hilarious perfection by the Met’s Susanna Phillips, and Agrippina’s louche son, Nero, whom she wants on the throne ASAP, played with irrepressible humor by countertenor David Hansen. Poppea was Amanda Forsythe (another favorite guest artist of Boston Baroque), who was just delicious in a shocking-pink gown with a few too many necklaces. I had enjoyed Hansen and Forsythe two weeks ago [here] at a program of Monteverdi (sponsored by Boston Early Music Festival); they have fabulous comic chemistry. They will reappear in June in BEMF’s in Monteverdi’s L’incoronazione de Poppea. The emperor Claudius, played with class by Kevin Deas (another frequent guest of Boston Baroque), appears, at the opera’s opening, to have been drowned at sea. Agrippina plots for Nero to succeed him. Alas, the dead at sea, in operas, rarely remain dead. Putatively appointed successor by Claudius for saving him at sea, Otho is enamored of Poppea, who is also loved by Claudius, Agrippina’s husband. A pants role sung nicely by the French mezzo Marie Lenormand, Otho is the only morally uncompromised character of the sordid bunch. This sets the stage for all the shenanigans which follow, set in motion mostly by Agrippina, who is a laugh-out-loud glamorpuss, constantly looking in the mirror, primping, checking out her nails, bedecked in a shimmering gold floor-length shawl, gold pocketbook, and very high heels. Betrayals both real and imaginary occur almost as often as the characters deceive one another, and themselves. Other characters who helped make this such an outstanding production were Douglas Williams as Passas, a freedman; Krista River as Narcissus, another freedman; and Mark McSweeney as Lesbos, a servant of Claudius. The stage set was two halves of a Raphael fresco with a large armchair that doubles as a throne, and two revolving platforms. The production owes a great deal of its just short of over-the-top humor to the stage direction of Mark Streshinsky and the wonderful costume designer Charles Schoonmaker. Boston Baroque played very well under Martin Pearlman. They were never too loud for the singers. The continuo section, of cellist Jennifer Morsches, theorbo player Michael Leopold, and harpsichordist Michael Beattie, sounded excellent. Concertmaster Christina Day Martinson was, as usual, outstanding. 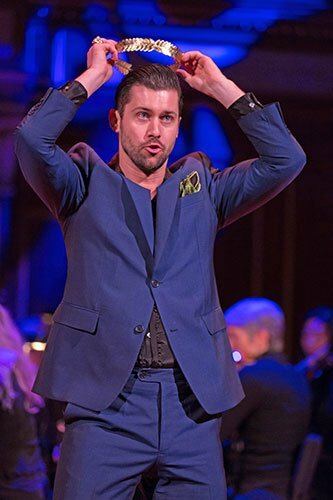 The big discovery for most of the audience was Australian countertenor David Hansen, who has had a meteoric rise to international fame in the last few years. He was funny two weeks ago, and hilarious here as an ambition-free young man who could not keep his shirt buttoned, or indeed even on, and who has a wickedly good sense of humor, and quite the impressive voice as well. Audiences seem totally delighted with him, as they were with the marvelous Susanna Philips, who sang gorgeously all evening. This Agrippina is high fun from beginning to end. Actually, the end was my favorite part. As the opera is finishing up in triumphal manner, everyone onstage singing, on come, instead of subtitles, follow-ups on the characters’ destinies. About half, it seemed, committed suicide. A few did ascend the throne, and Nero offed his mother. Well, someone had to. I was there, and it’s all true! After a couple of centuries of solemnity, it’s great to see opera return to what it must have been when people thought they were just going to hear cool music and have fun. Ham it up is right. Not trusting the audience to get the humor, all was overemphasized and underscored. Stage activities were played broadly and then repeated thanks to a director better with props than characters.That crown being manhandled, jewelry tossed about. Aggripina playing pointlessly and rather revoltingly with Poppaea’s hair. This meant that the Aggripina who sang of her nightmares was a complete disconnect from the Lucille Ball we’d been watching until then. I’ll be sure to avoid Mr. Steshunsky’s work in future. Well, Raymond, you probably should avoid not only Mr. Streshinsky’s future work (as well as misspelling his name and Agrippina’s name), but also most opera productions that do not intend to offer “period” performances with respect to sets, costumes, and direction. A lot has happened to Handel productions since 1709, and it should at least be noted that Handel wasn’t writing a cathartic tragedy but a satiric comedy. Anthony Hicks, in “The Grove Book of Operas,” describes this libretto as not only “witty,” but “a typically Venetian anti-heroic comedy.” I hardly think that Agrippina’s second-act scena, “Pensieri, voi mi tormentate,” need move us to any seriously sympathetic emotion as she contemplates a triple murder within the context of the libretto’s comedy. Otho is the one serious (and morally sympathetic) character in the opera, and he was justly treated here, with no extraneous comic turns. I don’t think you’d have liked Peter Sellars’s opera productions (his brilliant “Orlando,” or his equally brilliant “Giulio Cesare”) or, for that matter, Jonathan Miller’s Verdi productions. But there certainly are opportunities close to home for you to witness opera offerings that would please you, particularly the brilliant period realizations of renaissance and baroque operas mounted by the Boston Early Music Festival under the direction of Gilbert Blin. They are wonderfully faithful to the tragic and comic styles of earlier times. This production, however, was not intended to be a scrupulous recreation of early 18th-century comic style. It was, though, a delicious 21st-century reading of a nastily witty plot. Susan Miron’s review was right on.